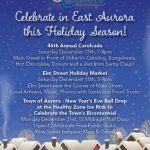 The Greater East Aurora Chamber of Commerce would be happy to list your chamber member events on our calendar. The following are our submission guidelines. All submission will be held for review by the Greater East Aurora Chamber of Commerce Staff. We reserve the right to edit copy or deny submission requests for any event we determine to be in appropriate or that does not fit within our guidelines. Submissions should be submitted in a timely manor. We recommend you submit your event several weeks prior to the event date to insure we have time to review and approve your event.